Shaka's words in 1818 after a victory over the Ndwandwe at the Mhalatuse River. Taken from Zulu epic poem, Emperor Shaka the Great: A Zulu Epic (Unesco Collection of Representative Works. African Authors Series) , translated by Mazisi Kunene, drawing on a number of Zulu oral historians. 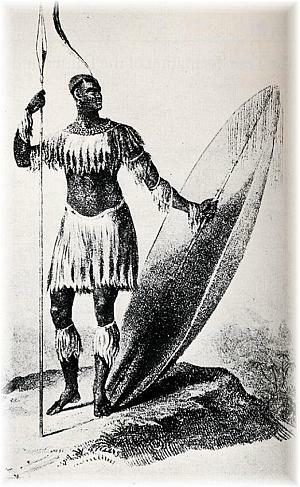 The young warrior Shaka became leader of the Zulus (the people of the heavens) in 1816. An extraordinary leader, he quickly built up his tribe until it was the most powerful in South Africa. For nearly twenty years during the 1820s and 1830s there was war and destruction in the central plateau. For the Zulus it was the Mfecane, or "crushing." The Zulus aggressively attacked and defeated other tribes in their area. Their success was due to Shaka's military brilliance and ferocity. He organized his society for warfare and developed an effective style of fighting that involved the use of short stabbing spears. As his power grew, he appears to have become mentally unstable. He increasingly ordered the deaths of his men for no apparent reason. Finally he was assassinated in 1828 by two of his half-brothers. This period of warfare between the tribes, the Difaqane, left the Africans weaker than before and more vulnerable to continual demand of the Europeans for more land. "The remnant of the enemy's army sought shelter in a nearby wood from which they were soon driven. Then began the slaughter of the women and children. They were all put to death....Early next morning Shaka arrived and each regiment, previous to its inspection by him, had picked out its 'cowards' and put them to death. Many of these, no doubt forfeited their lives because their chiefs were in fear that, if they did not condemn some as being guilty, they would incur the resentment of Shaka..."
Conflict between the Zulu and the British and Dutch continued. During the 1870s, the British were looking for a pretext to completely defeat the Zulu In 1878 they got it. The wife of Sihayo, a Zulu chief, fled with her lover into British territory. Sihayo's sons crossed the frontier into Natal and killed her. The British ordered the Zulu to disband their army and predictably the Zulu chief, Cetshwayo, refused. On this pretext the British army marched into Zululand. The Zulu, with vastly inferior weapons, killed 1500 British and defeated the army at Isandhlwana. It was a remarkable achievement, and the greatest victory ever won by Africans against Europeans in sub-Saharan Africa. The British reinforced their troops, however, and eventually defeated the Zulu at the Battle of Ulundi in 1789. The Zulu king ordered his warriors to stop fighting, since his people were starving. The British divided Zululand into 13 smaller states. This encouraged disputes between the chiefs and eventually there was civil war. In 1887 the British made Zululand a colony. "At this moment the Zulu power is...a menace to the peace of South Africa...yet what other results can be looked for from a savage people, whose men are trained in youth to look upon working for wages and the ordinary labor necessary to advance the progress of a peaceful country to be degrading...and to consider the taking of a human life as the most fitting occupation for a man?" "Mpande did you no wrong, and I have done you no wrong, therefore you must have some other object in view in invading my land. It cannot be because of Sihayo's sons. The English have just crowned me. How is it that they crown me in the morning and dethrone me in the afternoon?"